Set in the fantastic world of One Piece players are reunited with the main protagonist from the series Monkey D. Luffy, the young pirate aspiring to be the next Pirate King in search of the One Piece. 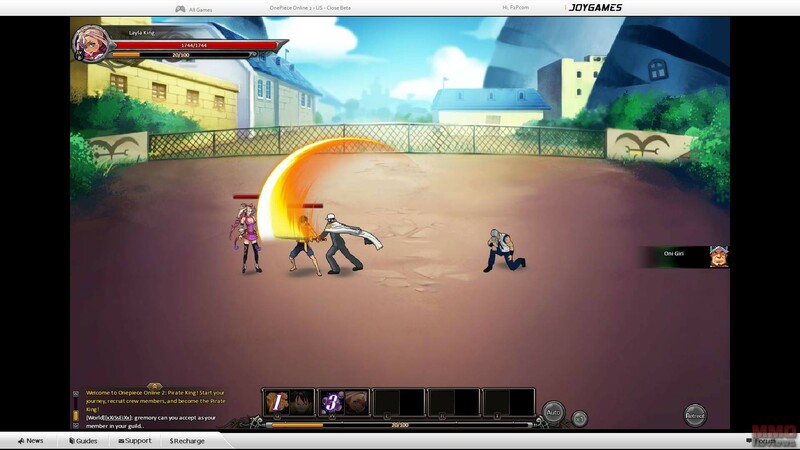 A sequel from the original One Piece Online RPG players will meet up once more with many of the famous characters from the shows and comic books to go on more exciting adventures in this browser based free to play game. Companion to the legendary pirate swordsman “Red Haired” Shanks, the very same who rescued the infamous Luffy, leader of the Straw Hat Pirates, from the Lord of the Coast, you are sent to seek out his old friend and join him on his journey to seek out the One Piece; the treasure of old Gol D. Roger that will make Luffy the next Pirate King. One Piece Online 2 is primarily a story-drive RPG with hundreds of quests for players to follow that will advance the plot and story-arc of the game, as well as take players to new locations where they will meet a bunch of familiar faces from the series; both companions and enemies. Recruiting these pirates into their Crew, players must train up their companions, equip them with gear, and fight through quests, PVE bosses and challenge other players for fun and rewards. Each player starts out by creating their own character with a choice of four template gender locked characters, each with a unique class and their own skills, players only get to name their character who otherwise is not customizable. The four available classes are the melee Sailor who uses a sword to strike at multiple targets, shield himself or protect allied Crew members positioned behind him in battle, the Sniper on the other hand sits at the rear and attacking enemies with ranged projectiles, lacking in defense but making up for it with high damage output. The Dark Mage can use crowd control by hypnotizing targets and also using her wisdom to identify an enemy’s vulnerabilities, whereas the Doctor uses her knowledge to heal up her Crewmates or inflict poison on the enemy. As players level up they will gain new abilities and the chance to add more characters to their crew in various formations, the level of every character and every upgradable piece of gear cannot be higher than the player characters level. There are dozens of different characters to find and recruit into your crew, each of which has unique abilities that are unlocked as they are levelled up by spending Beli, the currency earned through completing quests and various game features. In battle these characters will use these abilities when the team has built up Fury, each ability has a cooldown for a number of rounds once used, so players must manage their attacks and Fury resource carefully in the turn based combat. Crew are placed into different positions in the Crew formation; allowing stronger characters to be positioned on the frontline to soak up any physical damage, with defensively inferior characters on the back to make their ranged attacks in relative safety. The game has numerous features to explore including PVP where players can pit their Crew and their strategy against each other and battle for position on the leaderboards. As part of the wider adventures a Crew can set sail around the Grand Line seeking out the various challenges and Bosses that they can battle and, if defeated, will reap the greatest rewards in the game and mark them as being worthy of the title of Pirate King.